Destined for the pockets of buyers who want no more than a tiny Android with just the bare essentials, the BLU C4 does not even bother with 4G-LTE connectivity , which was all but a standard smartphone pro around the time of this Phonerated review -- don't miss out on the latest LTE-enabled phones here. Moreover, its rudimentary 1.3GHz quad-core processor is accompanied by a paltry 512MB RAM , which obviously puts it on the back foot versus some comparable Android Go Edition smartphones. Speaking of Android Go, its Android 8.1 Oreo Go Edition consists of lighter versions of standard Google applications -- a method of eating up less storage as well as boosting the phone's overall performance, which the C4 needs badly, considering its aforementioned old-fashioned processing pros and cons. It also comes with an inbuilt data manger for conserving mobile data allocation. Going back to its cons, the C4 is powered by a 1300mAh-only battery that somewhat belongs to the basic and feature phone categories instead of smartphones, knowing that tons of other low-end 2018 models start out with 2000mAh raw battery capacities. 1300mAh may just be what it needs, though, taking into consideration its heavily-outmoded 4-inch display , which sits on an 800 x 480 WVGA resolution and a 224ppi-only pixel density count. Joining its specs is a basic 5-megapixel rear-facing camera rigged with a standard LED flash and an HD-720p maximum video capture resolution, while another 5-megapixel camera for selfies sits right above its small screen -- note that unlike some of its siblings in BLU's C-series, it does not have a front-firing LED flash for brightening selfies up when shooting under poor lighting conditions. 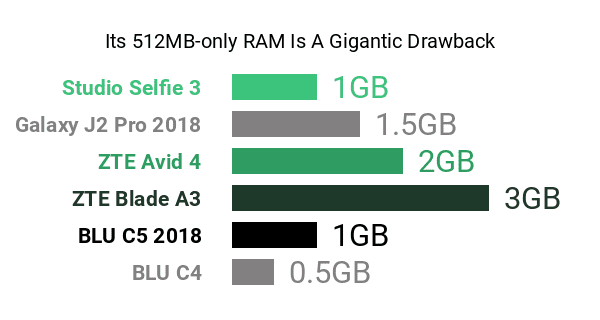 Also among the C4's pros and cons are an 8GB internal storage memory and a 64GB microSD card slot , both of which sound respectable, at least by 2018 budget-tier standards. This unlocked low-ender comes with two SIM card trays as well, while its exterior is coated in either Dark Blue, Gold, or Black. So, with its essentials-only approach in terms of technical features, the Android-Go-powered BLU C4 calls out to those eying a cheap introductory-class smartphone.